While some Metro Vancouver lakes and ponds are freezing over as the region is blasted with arctic air, people are being warned to stay off the ice and keep their pets close — at least for now. 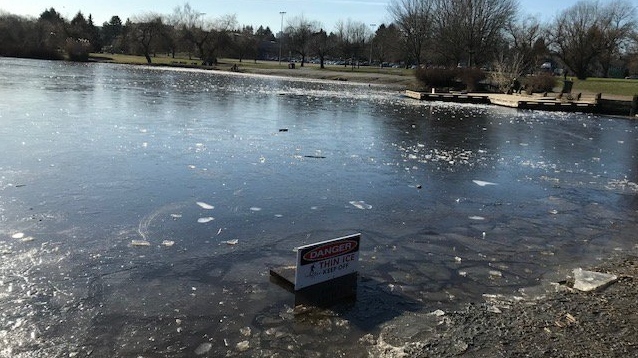 The Vancouver Park Board is keeping a close eye on ice at ponds in several locations, including: Trout Lake, Lost Lagoon, Jericho, Everett Crowley in South Vancouver, Queen Elizabeth Park, and Vanier Park. Park board staff have been measuring the ice every two days. As of Friday, ice at most of those locations is about two inches thick. The park board says the ice needs to be eight inches to be considered safe. Read more: There's snow on its way to Metro Vancouver. Signs warning people to stay off the ice have been placed on frozen ponds. But posts on social media show some people have been allowing their pets on the ice at Trout Lake, close to shore. The park board is urging pet owners to be careful, saying pets should be leashed near ice as they can easily fall through frozen water. In February 2017 a Vancouver Police officer had to jump into Lost Lagoon to rescue a drowning dog after it fell through the ice while chasing a ball. The last time a pond in Vancouver safely froze over was in January 2017. The frozen surface attracted thousands of skaters over several days during a cold snap. It was the first time in 20 years the ice at Trout Lake was considered safe for skating. In Coquitlam, city crews are also monitoring bodies of water such as Como Lake and Lafarge Lake this week. “Currently, we are not seeing any major ice buildup on city lakes," Manager of Parks Kathleen Reinheimer said in an email. “We would remind everyone that even if they do see ice on the lakes, it is likely not thick enough to support people or animals and for everyone’s safety they should stay off the ice." Como Lake was also opened for skating in the 2016/2017 season during what the city called an exceptional winter. It was the first time in 15 years there was enough ice to allow skating. The Vancouver Park Board isn’t weighing in yet on whether skating could be a possibility on any ponds if the subzero temperatures stick around. The board is simply urging people to enjoy the frozen ponds safely, which for now means taking in the winter sights from the shore.